plus CFE, CFM and adding a new one, CFA for students. The tests are progressively more difficult from CFA up to MCFE. purchasing, storage and more. They are progressively more math oriented. 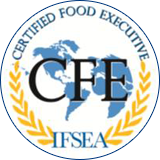 IFSEA's CERTIFICATION TEST REVIEW BOARD - Select to see who they are! Aramark (Rhode Island), CenterPlate/Sodexo (DC), DoubleTree/Hilton (San Francisco), Chef Robert Irvine Foods, HCA Healthcare (Austin, TX), Bay Colony Golf Club (Naples, FL), Vick's Vittles Restaurant & Air Force Base), and Safe Culinary Operation Restaurant Education (New Orleans). certifications, for the specific job, and industry segment, you are applying for. There are two points to the resume - education and certifications, and experience. 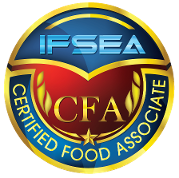 What is expected of someone who is IFSEA certified? They were motivated to building a professional portfolio. Through the process of study and testing, they logically know more than someone who did NOT have this experience. 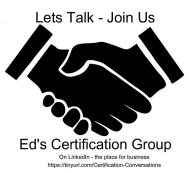 They know more and are better prepared for work than they were before they got certified. They are proud, and they know more is expected of them. Not everyone who graduates from an elite culinary school, as an example, is a great chef, but they established that when they get to a job, they are motivated to learn and grow in their field. $179 for MCFE, $169 for CFE, $159 for CFM and $99 for CFA. We suggest going for MCFE - 70% is passing, 65-69 earns you CFE, 60-64 earns you CFM. Contact us for bulk pricing for CFA. we will give you both MCFE and the program approved CFM, no added cost. For questions, contact IFSEA Certification Chairman, Ed Manley, MCFBD, MCFE. Email ed@ifsea.org or contact HQ at hq@ifsea.org or 855-268-1367. Thank you! FIRST - Pay using the BUY NOW button. The receipt will have your test access code - write it down. SECOND - The certification logo takes you to the training slide show and the test. For educators, the 5 PowerPoint training programs, with over 600 slides from our Partner GFI's test bank for Food Safety, Foodservice Management, Culinary Nutrition, Culinary and Customer Service. to fulfill the requirements of your school system.